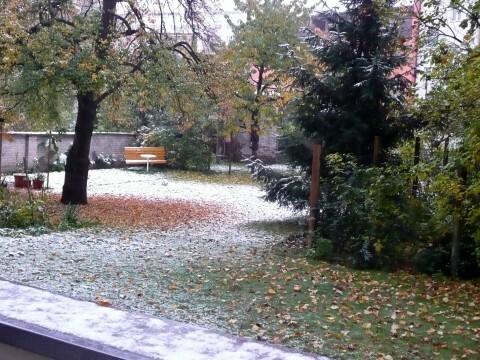 First Snow in Cottbus, 27.10.2012, Puschkin Park. According to the local newspaper (Lausitzer Rundschau), a team of two girls and two boys is responsible for this: Mario, Ursula, Veronika and Rafael. You'll find these key players on the weather map of today. Mario on Iceland and the ladies in Scandinavia and western Russia drive cold air from the polar region between them to the south, whereas Rafael moves warm and moist air from the Mediterranean Sea to the north. 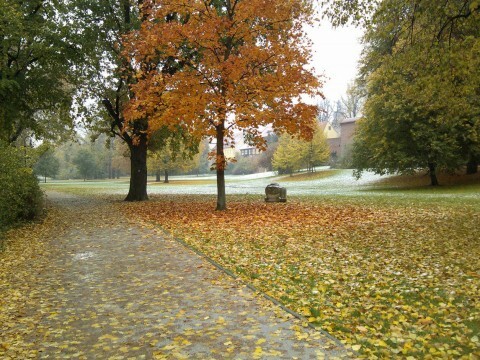 The warm air glides over the cold air, is forced to rise, cools down, moisture condensates and falls down. Into my garden. Klar! Der Schnee ist ja schon wieder weg.